The name of today's ielts speaking topic is- Describe a poisonous plant in your country cue card. 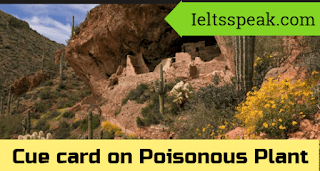 Below is the answer of latest ielts cue card on the toxic plant. Where can you find this plant? Positives and negativities of this plant? There are so many plants and flowers that are poisonous. However poison oak is the most common type of poisonous plant that is well known for causing an itchy, irritating and sometimes painful rash to those who touch it. The colour of its almond-shaped leaves ranges from light green to dark green. This dangerous plant has no thorns and is grown throughout the world in most of the countries. It is normally found in wooded areas, rocky areas and open fields as it can grow in a wide variety of soil types. It was my classmate who told me about this toxic plant when he was suffering the consequences of putting it by mistake. When he went for a picnic with his family members. He advised me to stay away from such kind of noxious plants. Which look almost similar to the other plants but are very toxic. The drawbacks of this plant are varied. Once it binds to the skin on contact, it causes severe itching that develops into reddish inflammation or uncoloured bumps, and then blistering. Apart from this, anyone may die if he or she directly consume any of its parts. Nonetheless, the benefits that mankind gain from this harmful plant extend well beyond the imagination of a common man and are likely to commensurate with its disadvantages. First and foremost benefit is its wide-ranging medicinal applications. For the production of medicines and vaccines to cure dangerous ailments such as cancer and TB, this plant is a primary source. Then, for surgeries and operations, the products of this plant are highly recommended. Last but not least this plant is believed to produce quite more oxygen as compared to the plants of its size. Therefore, I would say that whereas this plant is toxic, it's positive aspect cannot be overlooked. Which is your favourite plant? Are plants helpful for the environment? Do you like watering the plants? Do you like saving trees?